Boulder, Colorado has been named the happiest city in the U.S due to the healthy lifestyle of its residents. 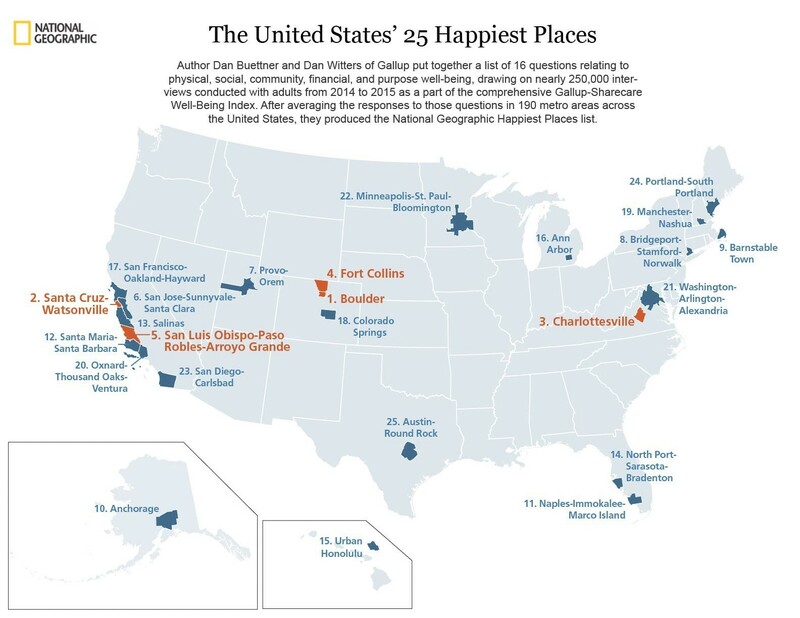 Boulder, Colorado is the happiest city in the United States. That’s according to the 25 Happiest Cities in the United States Index, compiled by National Geographic, Gallup and author and longevity expert Dan Buettner, which found multiple factors contribute to residents’ happiness. These include city-dwellers’ diets, how involved they are in their communities, how often they go on holiday, how easy it is to get around on foot or by bike, and even how frequently they visit the dentist. So what makes Boulder such a happy place? The city, located in a valley in the foothills of the Rocky Mountains enjoys enviable scenery and a remarkably pleasant climate. Residents spend lots of time outdoors thanks to the abundant nature on the doorstep, including miles of hiking and biking trails and plenty of rock faces to climb. Within the city, 300 miles of bike trails ensure that Boulderites are 17 times more likely to ride to work than the national average. More people also walk to work in Boulder than in any other city in the US. The population has low rates of smoking and obesity, and high rates of exercise. And the city government actively encourages residents to live healthy lifestyles. For instance, Boulder was one of the nation’s first cities to approve a tax aimed at reducing consumption of sugar-sweetened beverages. The city plans to use the money to fund health programs for children. In addition, the city matches, dollar for dollar, the federal Supplemental Nutrition Assistance Program – which helps low-income families buy healthy food – to encourage fruit and vegetable consumption. Boulderites overwhelmingly feel “active and productive every day”. Boulder has a sense of community, and those that live there fight hard to maintain the character of their city. New developments are not allowed to be built above a certain height, in order to preserve the stunning views. Caring for the environment is also important, and the city recently celebrated a 13.4% reduction in greenhouse gas emissions. But life isn’t always a bed of roses in Boulder. It’s an expensive place to live, with the cost of living well above the national average. Residents of Boulder surveyed for the index also reported higher stress levels than the national average, with almost half (49%) saying they felt stress. Some have argued that this might be “good stress”, based on the fact that Boulderites tend to have a sense of purpose and like to get things done. Over the last few years, the city has attracted big businesses, particularly in the tech industry. 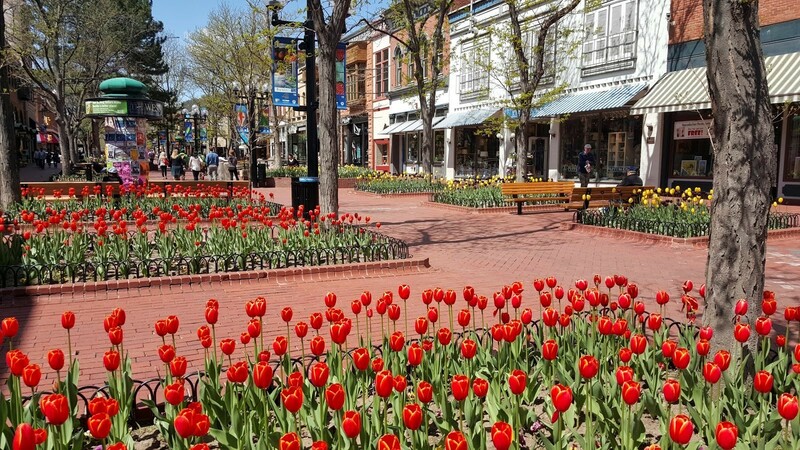 Not all residents are in favour of this change, and some have expressed concern that Boulder’s laid-back lifestyle will disappear as more workers with high salaries and a long-hours culture move in. “No construction has been watched with more trepidation by growth-wary Boulderites than Google's new $131 million campus, Pearl Place, at the intersection of 30th and Pearl streets,” says the local newspaper, The Daily Camera. Boulder also lacks diversity – over 80% of residents are white. Although the city government says it wants to change this, and last year employed its first diversity officer. There is also concern about age discrimination, with complaints in Boulder County above pre-recession levels, according to the Equal Employment Opportunity Commission (EEOC). Older workers are twice as likely as the general population to be among the long-term unemployed. One of the survey’s more interesting findings was a high correlation between a city’s bikeability and residents’ happiness levels. There was also a strong correlation between quality of water and happiness. Perhaps more surprising was the finding that residents in cities where people visit their dentists frequently also report being more satisfied with their lives. 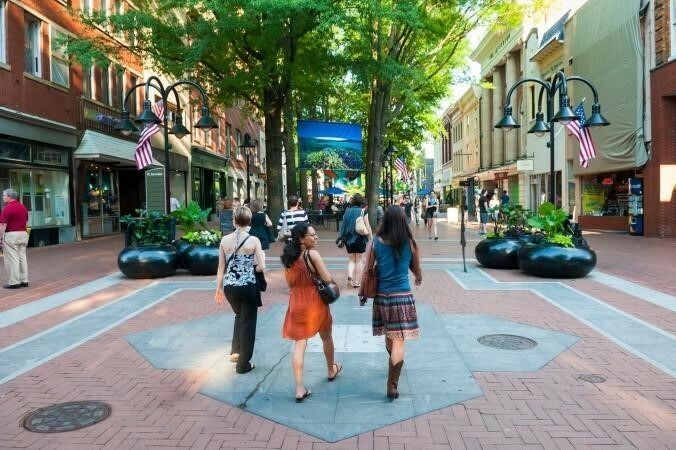 Common factors found across the happiest cities include residents who smile and laugh often, who socialize several hours a day, have access to green spaces, and feel that they are making purposeful progress toward achieving life goals. In these cities, people tend to feel secure, go on holiday and have enough money to cover basic needs. The report argues that city leaders play an important role in ensuring the happiness of residents, by making conscious decisions to favour quality of life over economic development or political expediency. The runners-up in the 25 Happiest Cities in the US Index were Santa Cruz-Watsonville, California and Charlottesville, Virginia, both of which, like Boulder, enjoy spectacular natural scenery and, in Santa Cruz’s case, beautiful, family-friendly beaches. But Charlottesville was the scene of violent clashes between white nationalists and counterprotesters at a rally in August 2017, which led to one death and multiple injuries. It was shocking for its open display of racist attitudes that many believed had been buried. Santa Cruz is grappling with a substantial homeless challenge. The least-happy places in the US, according to the study, are Charleston, West Virginia; Fort Smith, Arkansas; and Hickory-Lenoir-Morganton, North Carolina. Nearly 250,000 interviews were conducted with adults from 2014 to 2015 in 190 metropolitan areas across the US.